 First foreigners to cross the Indo-Burma border in two decades. 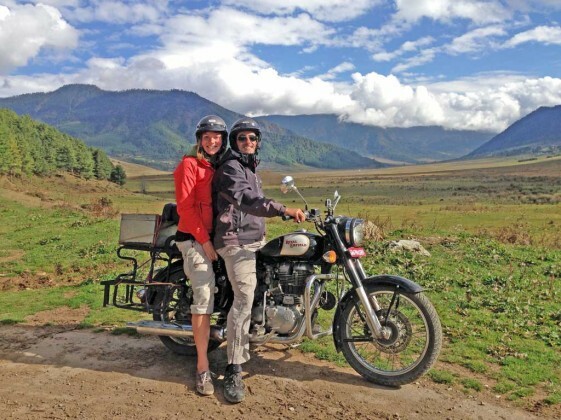 Andy and Emilie on their Royal Enfield riding through Bhutan. It started as just a crazy idea between Andy Benfield and his girlfriend Emilie Röell. They were discussing on the train how Andy still had his Royal Enfield motorcycle stored in Delhi, India from when the couple had lived there a few years earlier. They fantasized about picking up the bike and riding “two up” to their new home 4,000 miles (6,500 km) away in Rangoon, Myanmar. 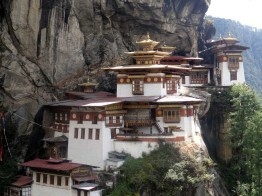 Tiger's Nest Monastery in Bhutan - One of the impressive stops on Andy and Emilie's journey. 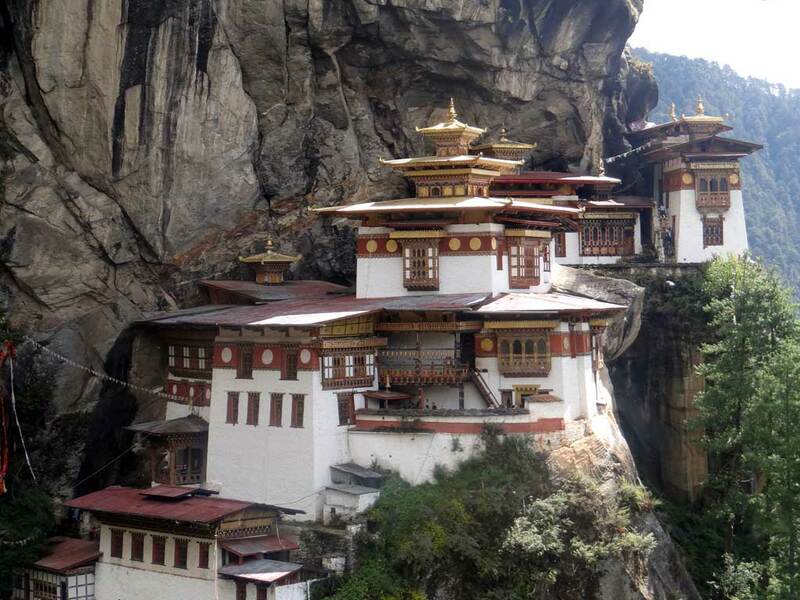 The idea of visiting exotic places like Kathmandu and Bhutan along the way was irresistible to this well traveled couple. They imagined the unique cultures, views of snow-capped Himalayan peaks and hidden valleys they would experience. Eventually, the lure of adventure overwhelmed them and they decided to start planning the trip. The major obstacle they would need to overcome was the fact that the border between India and Myanmar (Burma) was closed to foreigners. The border had been closed by India to curtail cross-border crime, including smuggling, drug trafficking, and insurgency. No independent foreign travelers had crossed the border for several decades. Their route would also have to pass through some of India’s most dangerous states in the restive northeast region. They had heard stories of rebels, drug traffickers and rogue Indian army units. Bombings, hold-ups and robberies were an all too common occurrence. Their route would take them on some of the harshest roads in the world riding through the Himalayas, increasing their chances of breakdowns. They would be riding a Royal Enfield, a motorcycle not known for its reliability. Without any mechanical experience, the couples chances of success looked bleak. There would also be a multitude of red tape involved in transporting a motorcycle across six international borders. Riding in the mountains above Kathmandu. 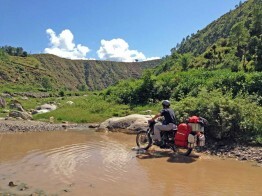 Adventure Bike Rider Magazine also published a story titled 5 lessons we learned while riding to Rangoon that details the misconceptions they had before going on their trip. You can also view the couple’s detailed ride report on their blog, Riding to Rangoon. 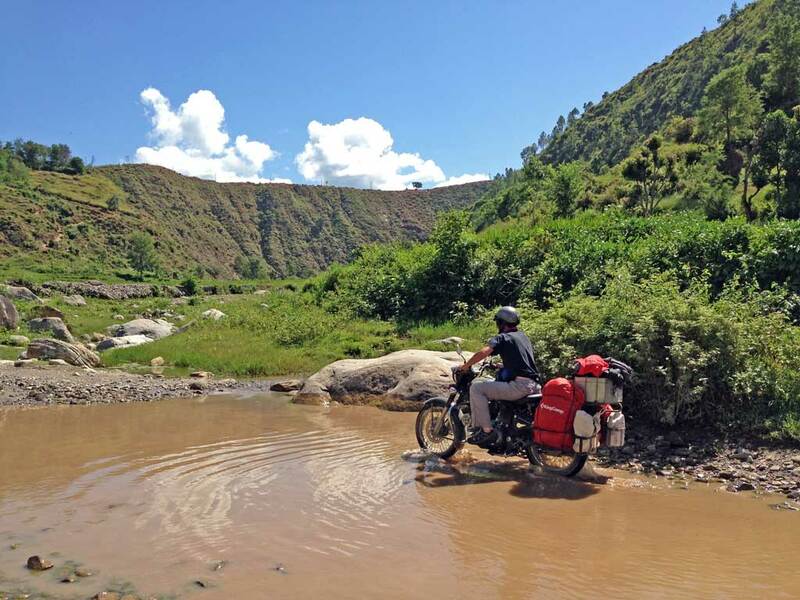 It’s good to see the border between India and Myanmar is starting to open up to foreign travel again and we applaud this brave couple for blazing a trail for the rest of the Adventure Touring community.